The Jews have a religious symbol called a talith (tallit), or a prayer shawl, that covers them when they pray. They claim that it envelops them both physically and spiritually, in sorrow and joy, in celebration and prayer. Today, this shawl is worn at all of the major feasts and festivals, but in Biblical times, it was worn constantly by the men while outside of their home. Even Israel’s flag was inspired by this shawl, adding only David’s shield to create their national flag. The word talith contains two Hebrew words: tal = tent and ith = little. In other words, it was a “little tent.” In the days of Moses, a large tent was set up according to the Lord’s command, a Tabernacle, where the Israelites could worship and offer sacrifice. This Tabernacle served as a pattern for individual and familial worship to the tribes. Each man was able to create his own sacred space where he could commune with God, free from the interruptions of the day. By taking the ends of the talith and pulling it over his head, a “little tent” was formed where he could sing praises to the Lord, meditate, and call upon the Lord in fervent prayer. In essence, the talith became his own personal sanctuary – a sacred grove. This may provide additional insight into the scripture “And my father dwelt in a tent” (1 Nephi 2:15). While in the desert Lehi certainly resided in a physical tent dwelling as was the custom, but could it also be a reference to Lehi creating a sacred sanctuary in the desert where he could commune with God and seek His presence? In addition to a sanctuary, during Jewish wedding celebrations the talith may serve as a canopy (chupah) for the bride and groom. Four poles hold up this tent, which represents both a home and the protection of God, who is above all, throughout their marriage covenant. The groom may also place the shawl over the bride’s head as a symbol of taking her under his care. As the talith is a protective covering, it represents prayer, communion with God, and the temple, and we can see the importance of these throughout marriage and family life. We can also see symbolism of the marriage of the Lord to his bride, the church. Although the shawl itself was of importance and made with quality, it became special because of the fringes (tzitzit) on the four corners which served as a visual reminder to follow the commandments and seek righteousness (Numbers 15:39). These tassels also stated the status, rank, and importance of the wearer, which explains why Jesus disapproved of the enlarged fringes used to magnify one’s own importance and status (Matthew 23:5). The hem of the garment often had the genealogy of ancestors written upon it. Removing the hem or fringe was equivalent of losing one’s status and position, such as the removal of a woman’s meant a divorce. When David removed the hem of Saul’s garment, it was an indication of Saul’s loss of status and power (1 Samuel 24:4). It is this same piece that some believe was the mantle given to Elisha by Elijah (2 Kings 2). 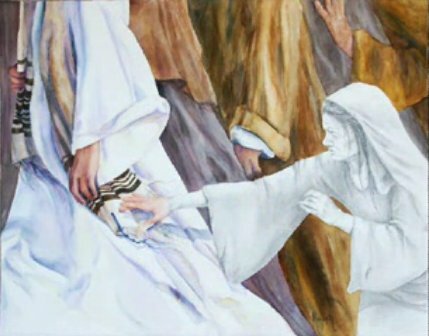 And we cannot forget the miracle of healing that occurred when the inflicted woman touched the hem (tassel) of the Savior’s garment (Luke 8:43–44, Matthew 9:20). “But unto you that fear my name shall the Son of righteousness arise with healing in his wings” (Malachi 4:2). The corners of the prayer shawl are often called “wings.” This provides insight into Psalm 91 which speaks of abiding “under the shadow of the Almighty” and “under His wings” (v1, 4). The places of our tents, when thought of as sacred and holy space, can comprise more than just the stakes that are referenced, as commonly interpreted. When we enlarge the place of our tents, we must start within us individually and expand outward. Our tents are found within and around us as we strive to create a holy, sacred place where we may commune with the Lord and feel His Spirit. Ultimately, through mastery and discipline in our personal, family, and community settings, we arrive at the largest and most holy tent of all – the temple and literal home of our Savior and Lord, Jesus Christ. It is this great privilege to come as His guest, to become His bride, in this most sacred place, that we must “spare not” and make every effort to receive and enjoy, for its benefits are for eternity. I appreciate this post. The ideas gave me some new perspective on face veiling. It is almost like creating a holy space within a holy space, another holy of holies. Very insightful. Thank you, Jennifer. Outstanding! This is very insightful indeed. Michaela, that’s awesome, too. Thanks all around. I too appreciated this post. Never thought sense could be made from the shortest line of scripture we have with Lehi dwelling in a tent. I guess that goes to show that there is meaning in everything. Michaela, I like the comment. A veil covers the most holy, and the tallith also covered the Torah scrolls when they were moved. This shows how sacred the scriptures and we as individuals are to the Lord to both be veiled. I liked how Jennifer formed “concentric circles” with the Isaiah passage. Like the concentric circles of Christ – children – angels – fire (prayer circle) in 3 Nephi and the ring dances, it shows that circles are very much a part of the temple life. The Isaiah passage works in both directions: an individual can start with himself to create a holy place and influence, working his way to the temple – but also in reverse, we can work in such a way that the temple and Christ becomes the center ring. So, both directions! Thanks for doing this guest post, Bryce! I do think the veiling face refers to prayer. And is not gender specific, but easily accomplished on this world because of fashion. But that on other worlds, the symbol is accomplished different. I think that D&C 110 if you read the historical background gives a wonderful example of the veil being dropped and that prayer being offered and the veil being lifted from their eyes and seeing the Lord and the prophets. I think too often we like to associate gender as the main issue, but I think that we all symbolically have veils over our eyes and that only through prayer we can come to know God. That after prayer we can see and know spiritual things. I have come to understand that where symbolism differs we should pay attention. I think that this article is wonderful. Guest posts are a great idea. Thank you, Jennifer, for this wonderful post! A lot of insights to be gained here. I never thought of Lehi’s tent in this context before and the idea of “wings” and the prayer shawl really adds a new layer of meaning to that scripture. Definitely a starting point for my own personal study and reflection. Thank you for sharing your insights and knowledge! Thank you for the many insights into the symbolism of Jewish customs. Much food for thought here. And it inspires more study on our part. I think that the answers to prayer can come from a “closet ” or our own “talith” (sacred personal communion) anywhere. So interesting. Thanks again for sharing. Great to have you as a guest writer! Thanks for sharing the symbolism, and referencing scriptural examples. Fascinating. Thanks for this post. I love things like this that help expand my vision and understanding. FWIW, I did a study on the tent theme in the Book of Mormon a while back. Here’s the link if it’s of interest. I just commented on a much older post concerning women wearing veils, and then I read this post which also seems significant to that same subject. How ironic. I loved this insightful article. Thank you! Jessica, This is an interesting take on the veil. Are you saying that only women wear a veil because of fashion, that men don’t just because it would be weird for them to wear a veil, but the symbolism is in effect for both of them? I have heard different explanations for veil wearing, and I really like yours, but haven’t understood why any explanation would pertain to women but not to men. Sadie- I think that the symbol applies to both men and women. I think that in this world, it was just easier to have women wear a veil, since it was more acceptable. The priests in the OT wore a head covering too (mitre). I think that it is important to notice when symbols differ, that by the act of differing there should be more attention paid to that area. I think that men might have an objection to wearing a veil. Or maybe there is symbolism in the mitre too, that we don’t notice becuase it is not as obvious (I have never pondered that before, but interesting thought). And I think like everything in the temple it has many layers, but that it applies to both genders, not just one. I find it an interesting idea to ponder what the Temple is like in other worlds. I assume they have them, and what they learn, what their Adam and Eve chose and what happened in their creation story. I think that the symbol applies to prayer. The patten is all over the scriptures, in King Lamoni, Lehi, Nehpi, Jospeh Smith. An interesting study is go to the Bible Dictionary and study Manifestations of God and the crossed referenced topics. Prayer is such an essential act that we must know what the Lord is trying to teach us. And really because the veil is different we discuss it more. It stands out in our minds. Thank you all for your comments. It is an interesting discussion. Jennifer did an excellent job in exploring the subject of the talith/tent, and you have added interesting thoughts. I want to remind everyone – please try to not directly reference things or acts in the temple. We can talk about things in a very general sense (i.e. women wearing veils), and reference ancient counterparts and practices (i.e. OT priests’ mitre), but we should not discuss things about our modern temple explicitly. Those sacred discussions should be reserved for inside the temple itself. Direct references will be edited. I’m sure you will all understand. Thank you Jennifer for a very insightful article. I spent many years with several Jewish friends and asked them often about the prayer shawls they wore on many occasions. They were either unwilling or unable to tell me what the symbolism was. I believed that it was too sacred to talk about and never pursued the matter. On a trip to Israel on El-Al Airlines, I was very curious about all the men, in their prayer garments, who crowded on the Jerusalem-facing side of the plane and prayed five or six times during the flight. It was an intense and very sacred time and we were told by the flight attendant that the pilot has to make corrections for the added weight on one side during these times. I also find that most Orthodox Jewish sects wear their shawls all the time out of their houses. I especially liked the way you related their practises to our understanding of the temple and symbols. I always find if fascinating that Joseph Smith could not have known about these things, and yet they are revealed through scriptures that he translated. Sometimes, it has taken scholars years to understand what has been written in the historic texts. Hope we see more in-depth articles by you. I have been taught that Jesus covered his head in the jewish tradition when he prayed. Also, I have visited the wailing wall in Jerusalem and all visitors were asked to cover their heads to show reverence with the cardboard caps they handed out . That is why I was a little confused when I moved to Texas and all the members here have the opposite tradition of removing any headgear during a prayer as they see it as disrespectful to wear a hat while praying. I am curious if anyone has done any research to see if this was one of the practices that was dropped by the early saints when they made the switch from Judaism to Christianity after the death of Christ. Great post! Thanks for some very interesting areas of discussion. Great post, Jennifer! Very well written and informative. You gave me a lot of things to think about…thank you! Great article Jennifer – I love symbolism, how it enriches studying the scriptures- It always takes my understanding to a deeper, personal, more applicable level. Wonderful thoughts on tents – made me think of Abraham’s family and in the Book of Mormon- tents toward King Benjamin. So much to think about here. Thank you. Such a wonderful and enlightening article! Now I can understand more the significance of stories like the woman who touched the hem of Jesus’ garment. But even more, it has helped me see more of the divine genius bestowed on the Prophet as he helped bring back the ordinances of the gospel. It hasn’t been a good day for me today at work, but after reading this beautiful article I have felt peace and reassurance. Today I am the weary woman who touched the hem of the Master’s garment–through this article–and I have been strengthened in my testimony. Thank you, Jeniffer! God bless you. I hope you don’t mind Bryce, but I posted a link to the article on M* and sent out a tweet on M*’s twitter account. Great post! Thank you for this. What a great explanation of the symbolism that can so often be overlooked and seen merely as an oddity. It is also a gentle reminder that there is more meaning in the scriptures than what you initially read, that we really must study, search and ask questions to gain full understanding. I was confused by the definition of tal=tent. I am unable to find that word in biblical Hebrew for tent. The word in Hebrew for tent is ohel. Tal with either the tav-lamed or the tet-lamed does not appear in any Hebrew lexicon I own. I stopped reading the article after that because it lacked credibility. However, if I am wrong I would love to see where tal=tent can be found in Hebrew. The relationship between the tallit and a tent can further be shown by the close association the two terms share in Judaism. In Jewish practice the Jew repeats these verses from the Psalms before putting on the tallit – “Bless my soul, Adonai. You are very great, clothed in glory and majesty, wrapped in a robe of light. You spread the heavens like a tent cloth” (Ps. 104:1–2). In addition, in order to make a private space and to concentrate, even in the middle of a group of people, a Jew might raise his tallit over his head like a tent. Such raising of the tallit above the head is often referred to as a sort of tent to the wearer. Jewish weddings will take place under a chuppah, or canopy of white cloth held from the corners of four poles. This may have reference to the Bible, where the couple was taken to a specially prepared tent to spend their wedding night. Or it may represent the tallit that the groom used to cover his bride, symbolically taking her under his protection. So it is not a direct literal translation of the Hebrew term, but more likely a meaning derived by association. Bryce, a sister lent me an excerpt from Larry Barkdull’s written work “The Three Pillars of Zion,” and in the section where it relates Jewish Marriage to the new and everlasting covenant (Zion, the Holy Marriage), it talks about veils in the Jewish Marriage tradition and how they signified that the wife was truly holy, consecrated, set apart if you will. The sister had underlined it, so I found it of interest. Thought you might find it interesting as well in light of ancient practices, etc. I really do think I’m going to have an interesting experience when I go to receive my endowment, to say the least.